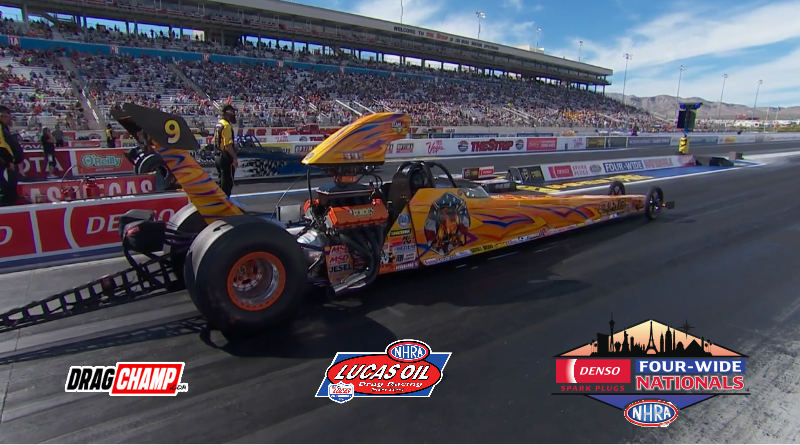 Las Vegas – Anthony Bertozzi made it back-to-back national event wins at the Denso Spark Plugs NHRA Four-Wide Nationals. Bertozzi’s Super Stock victory came on the heels of his recent Top Dragster win at the 50th Annual NHRA Gatornationals. Read more here. Bertozzi lead a host of winners including Doug Lambeck (Comp), Justin Jerome (Stock), Marko Perivolaris (Super Comp), Tanner Hiatt (Super Gas), Doug Crumlich (Top Sportsman), and Andy Spiegel (Top Dragster). Full coverage from each of the sportsman classes is listed below. In addition, DragChamp makes pre-race predictions at each national event. Follow along to see how our picks fared. Doug Lambeck drove his D/SMA ’08 Sunfire to his 13th national event win at the Four-Wide Nationals. With just a 12 car field, Lambeck only needed four win lights to earn his seventh Comp Eliminator Wally. Lambeck started eliminations against Winternationals class winner Scott McClay. In what would be his toughest round, Lambeck posted a -.584 under 8.476 to turn back McClay’s -.538 under 7.382. Randy Jones had problems against Lambeck in round two and Tom Mettler was a no show for round three sending Lambeck to the final round. Josh Lee, the number one qualifier, and his H/EA Bantam roadster had the advantage going into the final round. Both he and Lambeck had each lost .08 of index prior to the final leaving Lee with a four-hundredths advantage based on qualifying. As the tree turned green in the final round, Lambeck turned the tide with a .021 to .134 reaction time advantage. In what looked to be a great match up turned into a loop sided battle after Lee clicked it early allowing Lambeck to take the win. Lambeck’s winning time was a -.0473 under 8.507. DragChamp pick Ralph Paepeghem fell in round one to 2018 event winner Joe Mozeris. After winning Top Dragster at the Gatornationals, Bertozzi drove his SS/AS ’98 Grand Am to his his 23rd national event victory at The Strip. As usual, AB was deadly at the tree posting nothing worst than a .021 reaction. Bertozzi’s only “bad” light of eliminations occurred in his round two match up with Dan Fletcher. In a battle of Super Stock legends, Fletcher left first and turned it -.002 red. AB followed suit with a -.014 redlight of his own. After making his way through eliminations, Bertozzi locked up with Don Thomas in a tough final round. Thomas was .017 dead two but came up .0075-second short after Bertozzi laid down .012 total. AB was .008 at the tree and dead-on four (9.214) for the win. DragChamp picks: Anthony Bertozzi wins! Bertozzi took out our other pick Dan Fletcher, and Jackie Alley fell in round one to Jimmy DeFrank. Justin Jerome collected his first national event victory in his second final round. Jerome, driving his E/SA ’74 Duster, stayed close to his dial throughout eliminations and was solid at the tree. Jerome benefited from two bye runs during eliminations in addition to a first round freebie after opponent Scott Burton left before the tree was activated. After a fourth round bye, Jerome paired up with Ryan McClanahan with a bye to the final on the line. Jerome used a .025 light and a .013 over 11.123 to turn back McClanahan’s .034 initiated 10.074 (10.05 dial). The final was a classic heads up E/SA affair with Ryan Mangus. Jerome won both ends of the track posting a .007 light with a 10.818 elapsed time. Mangus, appearing in his fifth final round, was .028 at the tree while posting a slightly slower 10.858. DragChamp picks: Luke Bogacki and Brad Burton fell in round one while Jody Lang lost to Ryan Mangus in round two. In his fourth final round, Marko Perivolaris captured his third national event win. The win added to an already impressive season as Marko has already collected several victories in 2019 including doubling up at Sonoma. Read more here. Marko was amazing at the tree, never letting go worst than .017. His box score was .017, .011, .005, .016, .002, and .005. To reach the final Marko ran through a tough field that included Michael Miller, Kevin Wright (Winternationals winner), and Trey Vetter. Marko won three double-breakout contests and twice ran dead on the index prior to the final round. His best package was a .010-pack against Vetter in the semifinals. Waiting for Perivolaris in the final round was none other than sportsman super star Luke Bogacki. Bogacki, from the Sportsman Podcast with Luke & Jed, was equally impressive at the tree averaging a .014 light going into the final. To reach the final round, Bogacki defeated Lori Warden, Taylor Vetter, and John Labbous Jr.
Marko let go first in the final round taking a .005 to .019 advantage to the top end. At the stripe, Marko took .002 (approximately 6 inches) to take the double-breakout win over Bogacki. Perivolaris’s 9.038 came up a winner after Bogacki’s 9.026 was further under the 9.05 index. DragChamp picks: Aaron Kinard lost to John Labbous Jr. in round four, Labbous fell to Bogacki in the semifinals, and Chad Webber bowed out in round one. The third time was a charm for Tanner Hiatt after finding victory lane in his third national event final round. Hiatt started eliminations with back-to-back .002 reactions and finished with a .010 light in the final round. Driving his ’05 Corvette roadster, Hiatt waded through a tough field including Diana Anderson, Josh Dalrymple, Rick Cates, and Winternationals winner Pete Zak. Hiatt’s final round opponent was 2018 Super Comp world champion Steve Williams who was making his 24th final round appearance. Williams was stellar at both ends of the track throughout the event setting up a heavy weight battle for the Super Gas title. Tanner threw down .016 total in the final round leaving Williams mathematically ineligible after he let go .022. Hiatt’s .010 light and dead-on 10.052 more than covered William’s .022 light and 10.067. DragChamp picks: We picked Marko Perivolaris in the wrong class! He fell round one of Super Gas along with fellow pick Craig Maddox. Phil Unruh made it to the second round before falling to Labbous. Doug Crumlich, number three in the world last season, earned his first national event win in his first final round. Driving his ’63 Corvette, Crumlich was never worst than .029 on the tree and never varied more than two hundredths from his dial. Crumlich was involved in a number of extremely close races including his first round match up with John Taylor. Crumlich was .017 and .012 above to Taylor’s .024 and .009 above to take the .004-second victory. After wins over Kelly Harper and DragChamp pick Don Meziere, Crumlich took a .001-second win over Justin Lamb in the semifinals. Lamb was .007 and .022 above his dial to come up .001 short compared to Crumlich’s .008 and .020 above. The win sent Crumlich to his first national event final round. Jeff Gillette was equally as impressive in the early rounds, twice running dead-on his dial, while also posting stellar reaction times. In his fifth Top Sportsman final, and 11th overall, Gillette came up .005-second short of collecting his fifth Wally. Crumlich once again won a tight race after his .007 light and .021 over 7.031 was .005 better than Gillette’s .010 light and .023 over 6.963. DragChamp picks: Don Meziere fell to eventual winner Crumlich in round three and Dan Lafferty fell to Gillette in the semifinals. Andy Spiegel took home Wally number two at the NHRA Four-Wide Nationals when he defeated Robert Tehle in the final round. Spiegel’s run to the trophy was almost derailed in round one. Spiegel posted a dead-on 6.719 lap although his opponent, Taylor Vetter, had problems as was well off the pace. After second round opponent Thomas Bayer was a no-show, Spiegel paired against Ed Olpin in round three. Olpin was .044 and dead three to come up .003 short against Spiegel’s .044 package. In the semifinals, Spiegel stopped a red-lighting Anthony Bertozzi who was looking to double up. This moved Spiegel into his seventh national event final round where he squared off against first-time finalist Robert Tehle. Although Tehle nailed his dial with a four, his .059 light sealed his fate. With an .011 light and a .026 over 6.736 ET, Spiegel cruised to his second national event win. DragChamp picks: Thomas Bayer was a no-show in his second round pairing with Spiegel and Zach Sackman fell in round one.